Social housing has many virtues: it provides families with a secure home at a reasonable rent, and the state with a smaller benefit bill and an asset to leverage. So what’s not to like? Other than the upfront cost, perhaps the most enduring objection we hear to the tenure is that it may have a downward effect on rates of work, and that building new stock could have the perverse outcome of driving up unemployment. But does the evidence support this claim? It is certainly true that social renters have lower levels of employment than those living in other tenures. Looking at period 2014-2018 (and focusing only on the working age population), just over half of social renters were working, compared to four-fifths of owners and private renters combined. That’s quite a gap – and one which policy makers are right to probe. 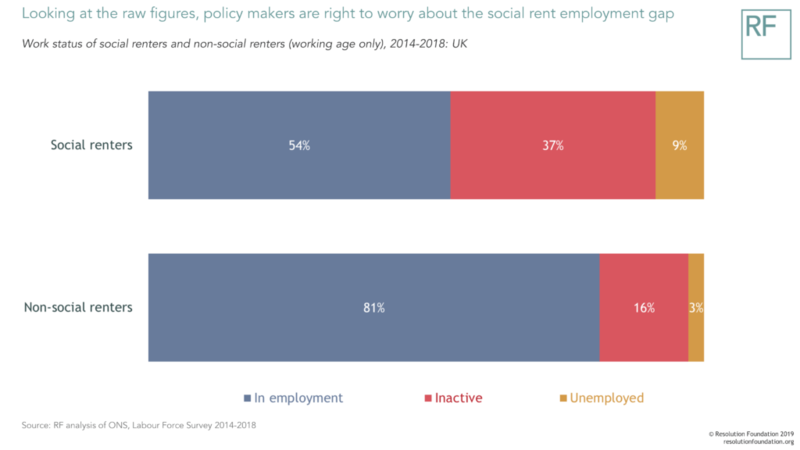 More than a third of social renters are inactive in the sense of not working or looking actively for work – more than twice the proportion of the rest of the population. These headline results should make us sit up, but are far from the full story. After all, groups with lower employment rates have always disproportionately lived in the social sector while allocation has, over time, become ever-more linked to need. As the Hills Review noted over a decade ago, social renters are much more likely to be parents (especially lone parents), to have a health condition or disability, and only low-level qualifications. These are characteristics that, regardless of tenure, reduce engagement with the labour market. So what happens to inactivity and unemployment rates if we assume social renters have the same characteristics as the population writ-large? 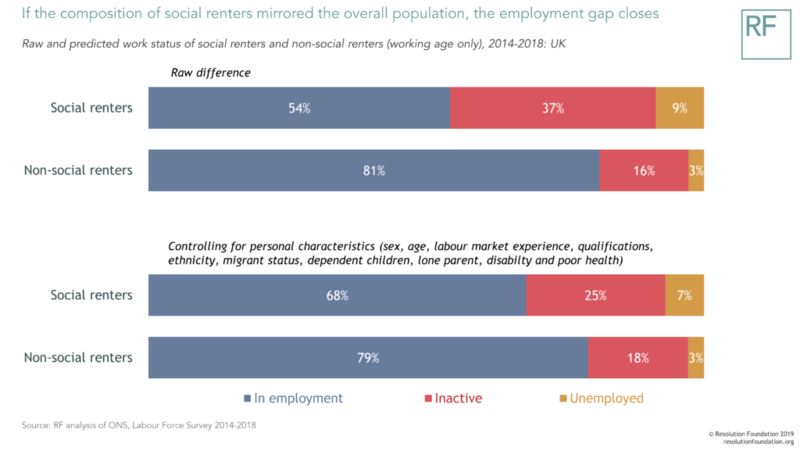 The chart below shows that if we control for such factors (and interact them, to account for the fact that many social renters have lots of these characteristics at the same time), 60 per cent of the employment gap disappears (falling from 27 to 11 per cent). If all tenures matched the characteristics of the population as a whole we could expect 7 out of 10 social renters to be in work, compared to 8 out 10 living in other tenures. The effect of the exercise is strongest on inactivity rates: controlling for personal characteristics reduces the inactivity gap between social renters and others from 21 to just 7 per cent. There are good reasons, moreover, to think that the effect of personal characteristics on social renters’ rates of work is likely to be stronger than we are capturing here. To begin, there are other variables that are likely to have a downward effect on employment that we cannot put in the equation: lack of literacy and computer skills, for example, or time spent out of the labour market. But just as importantly, early qualitative research we have conducted on social renters’ barriers to employment shows there are aspects of people’s lives that are not just amenable to this type of analysis ­– how do you really measure the quality of family support, for example, or the acuteness of a mental health problem? These limitations aside, we still observe a significant gap between the rates of work of social renters and those in other tenures. But could there be other factors at play beyond personal characteristics that explain the gap? Social renters have a low level of choice over where they live and low rates of residential mobility compared to private renters, meaning they are less likely to ‘pick’ the local labour market they live in compared to those in other tenures. So could place be having an effect too? To test the hypothesis that social renters live in areas with weaker labour markets and fewer job opportunities we explore a new source of data, DWP’s Find a Job website. While the site does not contain a representative sample of vacancies, it does contain records of around 160,000 jobs per month of exactly the type that those who are unemployed are most likely to be directed towards. 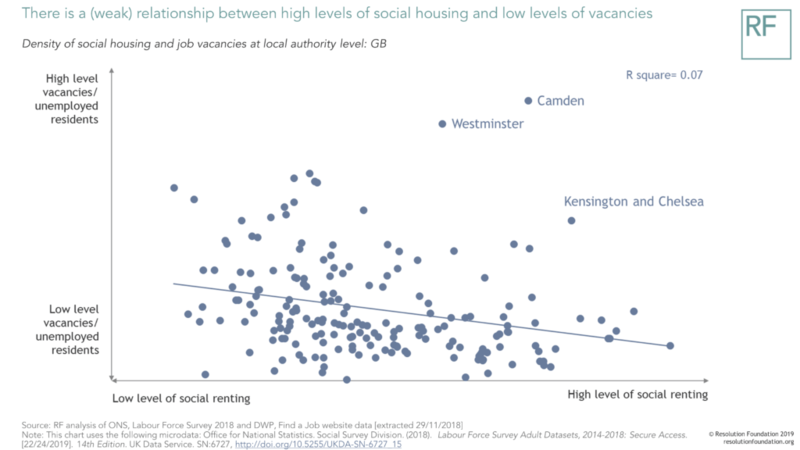 Using data scraped from the site we construct a measure of vacancies per 1,000 unemployed residents at the local authority level, and compare this to the concentration of social renters in the same area. The results of this experiment are set out below. 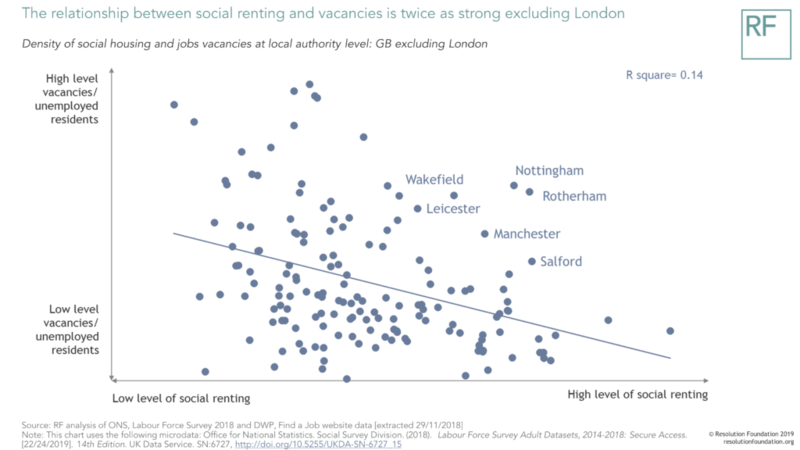 As this makes clear, it is the case that social renters are more likely to live in areas with weak labour markets. However, the gentle slope of the trend line shows the correlation is weak. A look at the outliers is interesting however, as several are London boroughs, many of which have both high densities of social renters and large numbers of vacancies. Given this, and the fact that local authorities across London are highly connected (the ONS treats London as a single ‘travel to work area’, for example), we can present results excluding the capital. On this account, the relationship we see between the density of social renters and weaker labour markets is now twice as strong. While plugging a ‘weak local authority labour market’ variable back into our original analysis has only a minimal effect, it is worth noting that once more we are unlikely to be picking up the full effect of place. Given that those on lower incomes (and women) commute for shorter times, and are more likely to use cheaper but slower forms of transport such as the bus, many a social renter’s labour market is likely to be smaller than the local authority. Combine that with the fact that lots of (especially older) estates were built on the fringes of cities with often very poor transport links, and it is easy to see how important place could be in the real world to explaining the gaps between the employment rates of social renters and those in other tenures. While the startling raw employment gap is nowhere near the full story, it should not be waved away or ignored. What we have found to date suggests more micro-level (and qualitative) research is needed – in particular to see how tenure interacts with local labour market strength and transport connections. But some implications for policy are already clear. To begin, our work suggests that disability and poor (especially mental) health explains a very large part of the inactivity rates of social renters. Serious investment in and evaluation of ‘closer to work’ programmes – such as piloting the community-based ‘saturation’ models that have proven success in the US – would be an eminently sensible use of resource. Second, building new social homes in areas which are close (or connected) to jobs is key, but comes with some tough trade-offs. As we flagged earlier this week, building in buoyant areas with higher land values will mean a higher unit cost. Are we prepared to accept that fewer homes for social rent will be built if the job prospects of their residents are to be improved? Alternatively, if new social homes are built in cheaper, more peripheral, areas then finding funds for transport links will be key. Third, creating mixed neighbourhoods is clearly the way to go too. If a non-social renter lives in an area where the houses are all privately owned they have an 80 per cent chance their (working age) neighbour has a job; for social renters living cheek by jowl, this chance falls to just over 50 per cent. Given that word of mouth is an especially important way of finding work for those on lower incomes, creating local communities with a sensible social mix matters. And finally, there’s a macro-economic take away from all of this for policy makers to ponder as well. As the chart below shows, social renters’ employment rates are more vulnerable to the cycle than those living in other tenures. 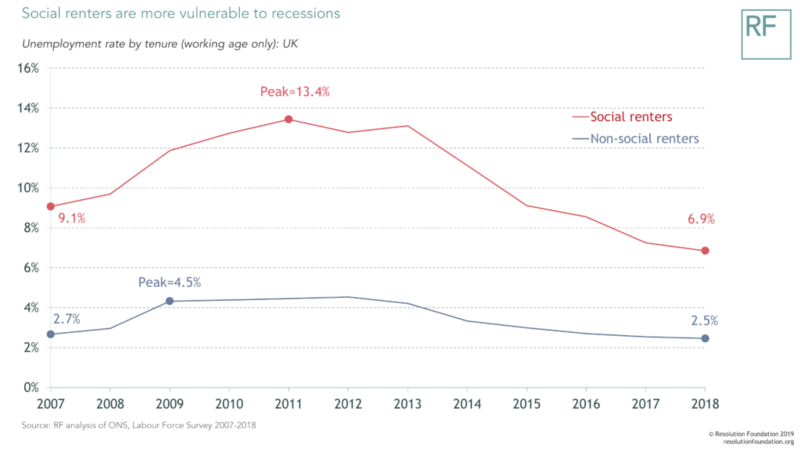 During the latest recession their unemployment rates increased from 9 per cent to more than 13 per cent (compared to 2.7 to 4.5 percent for non-social tenants), before falling faster in the aftermath. While the low level today is something to celebrate, this also makes clear that one of the best things governments can do to protect the employment rates of social renters is avoid (or at least smooth) recessions as far as is possible. All in all, it would be remiss to use the raw employment gaps between social renters and those in other tenures as a reason not to build more homes in the social sector. But it would be equally wrong to reject concerns about rates of work out of hand. It’s time we had a less polarised, more evidence-based conversation on the topic.